Ini Avan (Him, Here After) Ashoka Handagama's latest film is screened at EAP cinema halls. Two main male and female artistes of the film talk to Montage about their experiences. Niranjani Shanmugarajah who played the second leading role has proven her acting skills in many Sinhala theatre productions. She made her debut as a film actress in Ini Avan. Darshan Dharmaraj played the main male role in the film and made his mark as an actor. Ini Avan is a Tamil movie based on society's reaction to an ex-LTTE soldier who had returned to his home town. At the end of the movie Handagama reveals the bitter reality that it is not enough to rehabilitate one individual without rehabilitating the entire society. Question: What influenced you to take to acting? Answer: Niranjani: As most actresses I too was fortunate enough to learn my ABC in acting on the stage. Being a Tamil, I got a rare opportunity to experience the acting talent in the Sinhala theatre. However, I won the best actress award in 2011 at the Youth Drama Festival for the Sinhala drama 'Format' directed by Tharanga Priyadarshani. So far I have been involved with a few stage plays and radio dramas produced by Young Asia Television. Darshan: I was passionate about acting from my childhood, and was involved with theatre productions since my school days. I'm thankful to my teachers and my brothers who identified my inborn acting talents and the encouragement I received to choose the field. 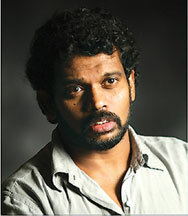 I was introduced to the Sri Lankan art field by Sidney Chandrasekara in his teledrama A9. So far I have been involved with 23 teledramas and 15 films. Ini Avan is my second Tamil language film. Q: How did you get involved with Ashoka Handagama's latest Tamil language film, Ini Avan (Him, Here After)? A: Niranjani: I was introduced to Ashoka Handagama by Amal Alwis. He told me that Handagama was searching for a Tamil actress for his latest film. Although I am a Tamil, I never had an opportunity to act in a Tamil production since there are no Tamil cinemas in the country. Therefore, I was excited about the news and it's a privilege to work with a veteran film director in the country. He selected me for the second main female character because what he had in mind tallied with my outer appearance and I believe I did my best for the character. Darshan: I have worked with Handagama before Ini Avan and there was a good understanding between us. Therefore, he invited me for the main male character of Ini Avan and it was a privilege to work with Handagama in his first Tamil language film. Q: What is your experience working with Handagama? A: Niranjani: The shooting started in September 2011 and the entire shoot took place in Jaffna. All the artistes were Tamil. Ini Avan is the first film shot in Jaffna after the war and it's an unforgettable experience to work in such a production and with Handagama. Throughout the process Handagama was patient with the acting crew to get their best. He explained each and every scene and he performed to show us the acting delivery and the tone he required for a particular scene. He was never willing to compromise what he wanted from the actors and spent time to explain the script and moulded us with the characters. Darshan: Handagama is a rare director who could get the best out of an actor. I have worked with him 10 years before and I know what he wants from me. He is a person who never had any racial or cultural problems. He could absorb with any culture or religion and work in harmony. He always wanted to highlight actors and worked towards it. He spent a lot of time on understanding the characters' backgrounds. He's the 'coolest' and the most intelligent director I ever know. Q: What do you mean by 'acting'? A: Niranjani: This is my first cinema experience. Before that I worked in a few theatre productions. On stage we do everything live. Dialogue delivery, acting style, everything is different in cinema compared to the theatre. It is a must to keep the mood and feeling in one scene from another in the cinema, which is not needed in the theatre. It was a novel experience and learning for me to get involved with Ini Avan, and throughout the process I learnt how to act naturally. Darshan: For the past 15 years I have acted as many characters in teledramas and the cinema. Most of the time I represented LTTE cadres or suppressed the Tamil youth. I was labelled for this character. For me acting is something you perform without letting your audience know that you are acting. I am thankful to Handagama for giving me the opportunity to do something extraordinary. Q: What you believed as 'acting', was it ever challenged after Ini Avan? A: Niranjani: Yes, today what I believe as 'acting' is completely different from what I believed before. I was influenced by the Bollywood and Kollywood cinema. I believed their hyper and exaggerated acting methods before I met Handagama. It was quite a different acting style that he expected which I never thought about. I learnt, without a single dialogue from a breath we could make the audience feel. Therefore the Sinhalese directors could change my attitude towards 'acting'. Darshan: Even though in Ini Avan I performed the LTTE cadre's character, Handagama wanted to highlight the humanity through my character. He is an excellent director who could build a story with expressions without a single dialogue. I could learn a lot about different acting styles from Handagama and it was like learning a new lesson in a new school. Q: What is the feedback you received from the audience? A: Niranjani: As a profession I'm a television program presenter and I used to talk a lot. All my fans and friends are surprised to hear that I performed a character in Ashoka Handagama's film because it is a known fact that his films are serious with less dialogues. Nobody believed I could do such a character. However, now all of them appreciate my performance in the film Ini Avan. Therefore, considering the feedbacks I received so far I think I have succeeded in my character in Ini Avan. Darshan: So far I have received many compliments and appreciations from the Sinhala community rather than the Tamils, because there's no Tamil cinema industry in the country and most Tamils watch South Indian films. Therefore, it is a gigantic step taken by Ashoka Handagama on behalf of the Sri Lankan Tamil community. It is not an easy task to establish Sri Lankan Tamil cinema as an industry where we have to counter with the South Indian film industry which is huge. However, as a Tamil citizen in the country I appreciate his attempt and I hope it would be the beginning of a new era for the Sri Lankan Tamil cinema.